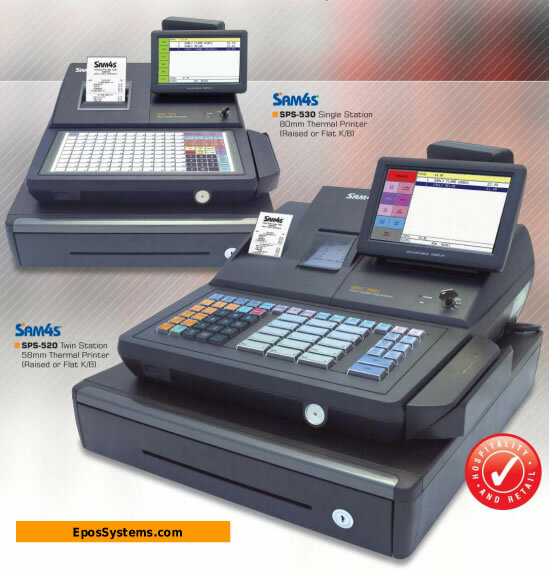 The Sam4s SPS-500 Series combines a colour 7" touch screen system with a heavy-duty retail keyboard, an integrated cash drawer and receipt printer providing a low-cost total retail EPoS solution, with stock control, for your retail shop. Our package price includes a Laser Barcode Scanner with Stand. The SPS-500 is very easy to set up, very easy to use, yet has a comprehensive range of features. The SPS-500 series are very popular in retail convenience stores, grocers, minimarkets, newsagents, off licenses and gifts / accessories stores and other types of shops, providing the full features of an EPoS system in a neat integrated cash register housing. With the optional Weighing Scale link, which is Trade Approved, the SPS-500 is also suitable for fruit & veg stores, fish mongers, farm shops, delis, and similar business where items are sold by weight. The SPS-500 shop till system is very easy to setup and very easy to use. You can quickly add new products as necessary, change prices, update buttons on the touch screen and program mix & match offers. 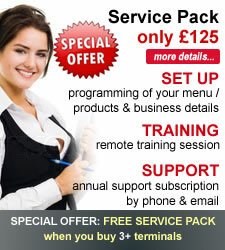 Initial set up and remote training and annual support is provided with our Service Pack. The equipment is covered by a 3 year warranty. The SPS-500 from EposSystems.Com has rom-based EPoS software and an intiuitive 7" touch screen. The touch screen can be used for registering non-barcoded products and supports upto 200 menu screens, each with upto 24 buttons, for your different product categories. The keyboard, on-screen menu and application functions can be customised by us to suit your particular business requirements with an array of features. Overall, the SPS-500 is an affordable POS system, robust and reliable in operation, with comprehensive features backed by a 3 year warranty from Sam4s (a former Samsung division), a leading international manufacturer. The machine is sold in 60 countries worldwide. * Approx 6,000+ PLU's. 20,000+ with memory upgrade dependong on function configuration.. The Service Pack includes initial set up of the system with your business details and menu/products, a 1.5 hour remote training session and a Level One Support Subscription. Technical support is included for the first year provided you have included the Service Pack. Available during office hours Monday to Friday by UK-based staff. All our systems include a Lifetime Software License that is part of the original package cost - you never have to pay any ongoing monthly or annual software license fees to continue using our systems - you only pay once at the start and that is it. Friday 19-April-2019 23:16 Our office is currently closed. We will be open again from 10am tomorrow.